Kalidades is my wedding florist. We had a bad experience with my sister's florist 5 years ago. The supplier seemed nice and good but on the day of the event, it turned out that the choice of flowers and the arrangement itself are not what she promised to us when we signed the deal. She told us she's gonna use imported flowers but you can hardly see imported in her arrangement. That's why I have always been wary with my decision on which florist to get for my wedding. I don't need the fancy, very expensive floral decoration but I just want to get my money's worth, if you know what I mean. Flower arrangement is one of my least priorities as far as my wedding expenses is concerned. But I must say, it still made a great chunk from our budget. If I had a choice, I wouldn't spend that much for my flowers but after spending a great deal of time looking for a good but affordable florist, I realized that in this time and age, I have made a reasonable deal. I just hope that unlike my sister's supplier, they would be true to their word with me. I may not get the exact arrangement in the photo for my reception, but I'd like to have something similar. 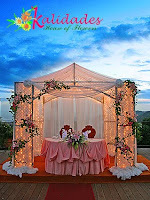 I think gazebos look romantic and chic. Now, I'm going to talk about my make-up artist. He is Emi Ayag. She's pretty, isn't she? 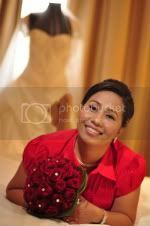 Much prettier than the bride, I would say, lol! Definitely one of the best make-up artists in town! It comes with a hefty professional fee, but I don't mind as long as he's going to make me look the best version of me on my wedding day. The last thing I would want is to look pasty white and fake-looking on my big day so I invested a little bit more for my make-up artist. I am almost done booking my major wedding suppliers. I still need to do some more when I go home in November but at least I have taken care of the most important details. Truly, weddings are stressful but this is my dream wedding so I'd like to be very hands-on in choosing the people who's going to help me make this day a fab and memorable one. hi sara, thanks for visiting my blog. im glad u liked it. it's fulfilling to have new readers that actually appreciate my blog like you. u have a fun day!